Lilies are beautiful, fragrant plants with flowers. They bloom outside from late May to August. But most of the year they can still commonly be found in bouquets and floral arrangements. But beware, lilies are toxic to cats! What Part of the Lily is Toxic? All parts of the plant are toxic, especially the flower. Even the orange-yellow pollen is toxic and the large amount of pollen can get everywhere, including on a cat’s coat or paws where it can be ingested while grooming. 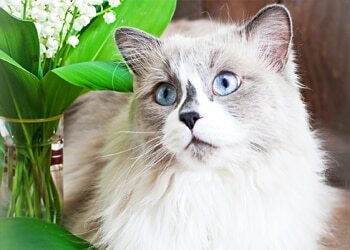 Even a single bite of a flower or leaf of the plant can be deadly for your cat. How Are Lilies Toxic to Cats? Cats can suffer from kidney failure after ingesting even tiny amounts of the plant and flower or drinking water from the plant. Cats are very sensitive to poisoning by Easter lilies. The kidney is the primary organ affected, and cats can die of kidney failure 3-5 days after exposure. The lilium plant family contains around 100 potentially toxic species and many hybrids. The more common lily species that are known to be toxic to cats are the Easter lily, Tiger lily, Asiatic lily and Stargazer lily. What makes lilies poisonous and how the poison works is still unknown, but it is known that the toxin is water soluble and deadly. Initial symptoms usually develop 6-12 hours after ingestion and include vomiting, salivation, anorexia and depression. Kidney failure typically follows, and the signs are increased thirst and urination, dehydration and lethargy. Toxins build up in the blood as the kidney failure rapidly progresses, and there may be a recurrence of vomiting, decreased urine production or even absence of urine production, weakness, recumbency, hypothermia and death. Prompt veterinary care is essential. If you suspect that your cat has ingested any part of a lily plant, including pollen or water, consult your veterinarian immediately, or take your cat to an emergency veterinary hospital without delay. The sooner your cat sees a veterinarian, the better. Prognosis is good if treatment is started within 6 hours of lily ingestion, but preferably sooner. Prognosis is poor if treatment is delayed because kidney problems have most likely begun. Cats treated 18 hours or longer after ingestion have a very poor prognosis. Early, aggressive treatment is vital! Blood and urine tests can be used to diagnose lily toxicity. Treatment includes intravenous fluid therapy and protection of the intestinal tract with specific medications. Cats will need to be hospitalized for several days while their kidney function is monitored. For Woody, an American Shorthair cat. -The cost to treat the lily poisoning at the veterinarian was $1,542.74. -Pets Best reimbursed Woody’s pet parents $1,149.99. Learn more about pet insurance for your cat. By Dr. Matheys, a veterinarian and contributing writer for Pets Best, a cat health insurance agency.